The Rhinoback™ Manager is a small software program that runs on your computer. It allows you to select which files you want backed up, set schedules, and restore files when needed. The Rhinoback™ Manager starts up silently in the background on your computer at the scheduled times and finds the files that need to be backedup, compresses them, encrypts them, and sends them to the Rhinoback™ servers for safekeeping. The following screen shows the simplicty of the Rhinoback user interface. The common backup and restore functions are just a one click away. Useful statistics about your account and the status of your last backups are simple and easy to read. Advanced functionality is easily accessible under the tools icons at the bottom. 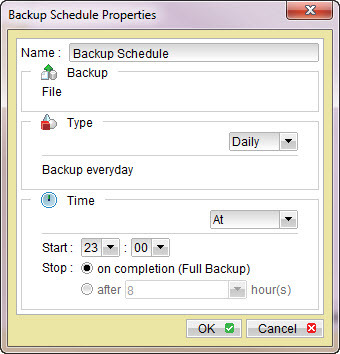 Setting your backup schedule is very easy, just pick a time. Or do nothing, and Rhinoback™ will backup your files once a day automatically. Rhinoback even allows your to setup multiple schedules to backup the same or differnt sets of files more than once per day. 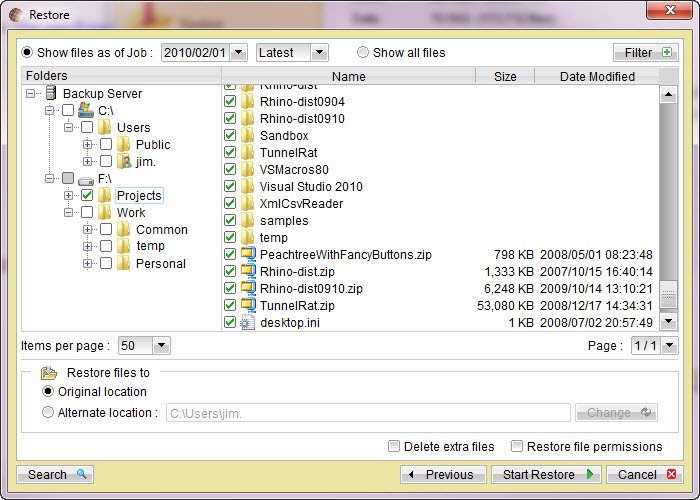 If you ever need to restore files, you can use the Rhinoback™ Manager to select the files that you want to restore. You can select a date if you want to recover an older version of a file. Older versions of files are retained according to a retention policy that you control. 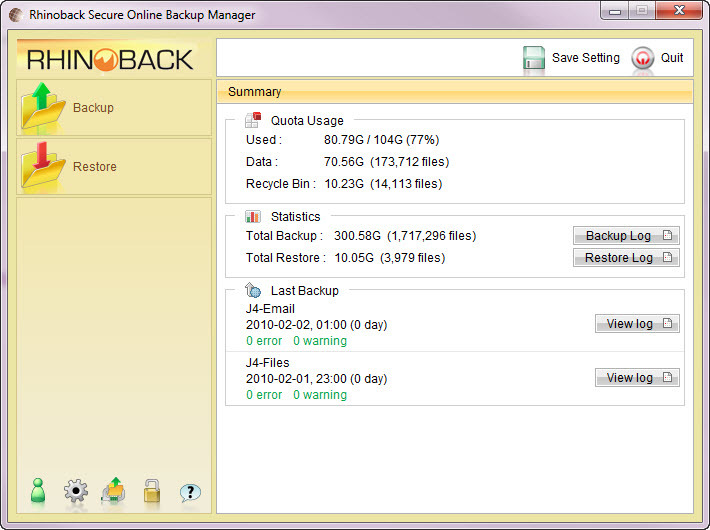 Unlike other cheap online backup services, Rhinoback does not limit your backup retention. When you first install Rhinoback, the default files selection includes your documents, your desktop and favorites. Your files will be backed up automatically every night. Even if you don't do anything after the simple installation, your most important files will be backed up daily without any additional effort. In the event that you lose your computer or data for any reason, your data can be quickly restored from Rhinoback at anytime 24x7. Rhinoback Online Backup is fully automated so you don't have to remember to do anything to keep your data safe and secure.